Check out our Graduation Information page on the Counseling website for important information about graduation day! Information includes dress code, time, location, parking and everything seniors and parents need to know about the big day! All AP exam fees are due to the counseling office no later than April 4th to be eligible to test. Please make sure to turn in your payment if you have registered to take an AP exam in May. Check out our Counseling webpage for more AP exam information including, dates, times and location. Weatherford High School PTSA is hosting the Kanga Run and vender event Saturday, April 5th. The one mile fun run begins at 9 a.m., and the 5K begins at 9:30 a.m.
t’s hard to believe, but Weatherford High School 2014 graduation will soon be here! I know all the 2014 seniors are very excited as senioritis has already begun. 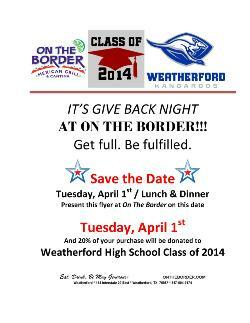 To help the seniors celebrate, we will host our traditional WHS post-graduation celebration, Project Graduation. Project Graduation is an annual tradition that offers our graduating seniors one last opportunity to gather as a class before they begin their journey beyond high school.